Brendon Murphy (meta-androcto) added a comment to T63749: Loops Tools Addon broken. hi, this task is also a duplicate of: T63242 so we are aware of the issue and will look into it. Juan Mendoza (juaninskirt) added a comment to T63749: Loops Tools Addon broken. Brendon Murphy (meta-androcto) triaged T63750: Remove Broken Addons from Release and Contrib as Confirmed, High priority. Brendon Murphy (meta-androcto) closed T63318: Doesn't work in the April 5th release of Blender as Invalid. Closing as invalid. no information provided. Brendon Murphy (meta-androcto) closed T54201: Blender crashes after Undo with 'Curve tools 2' addon panels visible as Archived. Brendon Murphy (meta-androcto) added a comment to T63242: Loop Tools don't work when modifiers are visible. @Philipp Oeser (lichtwerk) should we add a poll disabling the addon or a warning about modifiers? Brendon Murphy (meta-androcto) closed T63749: Loops Tools Addon broken as Resolved. closing as resolved, we should probably add a poll/warning to this. I did get some unexpected results when using mirror modifier. Brendon Murphy (meta-androcto) closed T63677: About LoopTools and Grease pencil as Resolved. Brendon Murphy (meta-androcto) edited projects for T63749: Loops Tools Addon broken, added: Addons; removed BF Blender. 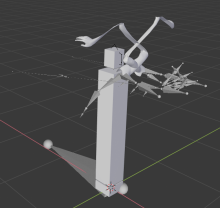 Sebastian Parborg (zeddb) merged task T63730: FBX Exporter Breaks with Rigged Character Animation into T63689: FBX export suddenly broken. Steven Babb (stvbabb) updated the task description for T63730: FBX Exporter Breaks with Rigged Character Animation.